Methods previously developed in this laboratory have been used to interferometrically measure the wavelengths of three absorption lines relative to the Hg 198 green line. The results are: P(1), 002–000 band of HCN, 15 345.2887 A in vacuum; R(15), 0111–000 band of HCN, 24 700.065 A in vacuum; R(18), 2–0 band of CO, 23 150.023 A in vacuum. The P(1) line is believed to have an absolute accuracy of 1 part in 107. The absolute accuracy of the other two lines is thought to be 1 part in 5×106. In addition, twenty-nine lines of the 002–000 band of HCN have been measured relative to P(1). The relative accuracy of these determinations is 1 part in 1.5×107. 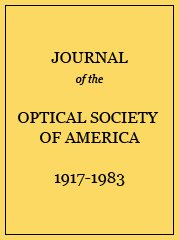 Data for the interferometric determination of the wavelengths of three absorption lines. a Meggers and Kessler.2 Standard air wavelength reduced to vacuum by means of the Edlen dispersion formula. c Preliminary grating measurements made in this laboratory. e N0=observed orders of interference. f S.H.=correction for slit height effect. g Nc=corrected observed orders of interference. Vacuum and standard air wavelengths in angstroms of some absorption lines. Unless otherwise indicated, the lines have been measured relative to P(1) of the 002–000 band of HCN. The vacuum values are measured; standard air values have been computed using the Edlen dispersion formula. R(15) of HCN and R(18) of CO have an error of 1 in 5×106 in absolute value. P(1) of HCN is probably accurate to 1 in 107 in absolute value. The other HCN lines have a relative accuracy of 1 in 1.5×107 and are somewhat less accurate than P(1) in absolute value. a Measured relative to the green Hg198. Observed vacuum wavelengths in angstroms for eight lines of the 002 band of HCN. All lines have been measured relative to P(1) of this band. Only the average values have been corrected for phase error.